Okay, so I just have to make this thread and give a huge shout-out to the guys over at SevenForums.com. By combining a number of their tutorials together I finally managed to fix a bug that has been plaguing me (and I'm sure many of you) ever since the Vista days. It's so glorious that I absolutely must share it in case there are people around here in the same situation and wishing there were a fix. So here goes! The thing is, in XP you could tell the OS just how you wanted to view things. Personally I use list view and can't live without the 'Date Modified' sort option in the right-click menu. So on XP, you'd just set a folder to list view, make sure your sorting option is there in the right-click menu, make sure you have your extension/hidden view sttings right then click "Apply to all folders." Bam, done. The OS would now display every single folder on your computer in list view just how you want it. Amazing stuff, couldn't live without it. But then you got to Vista and suddenly the OS was telling you what was best for you. When you'd try to do the trick from XP, it would only work part of the time and you'd have to do it to a bunch of folders. Even then, after a while it would conveniently forget how you told it to display and revert to ugly tile view or whatever the default was. In 7 this actually got worse, for instance splitting things into groups unnecessarily. It was a huge headache but for the longest time I just let the OS do what it wanted. Until now. To get the OS to act more like XP, one needs to do two things. First, you need to take command of one of the five default folder types. Personally I used the 'General Items' template as my own. To find this, open a folder (for instance, one full of TXT files or EXEs) then right-click inside the folder and click the 'Customize this folder' option. At the top it'll tell you what template that folder uses. You can use whatever you want, but I found that General Items was a better starting point. Okay, so you know which template your folder is using, good. Now in the folder you have open, make sure--just like on XP--that it's currently displaying everything just how you want it. Make sure the view type is correct, make sure the right-click menu has the sorting options you want, all of the same things you would've done in XP. Once you're sure it's how you like it, go to the 'Organize' button in the upper-left of the window and click "Folder and search options." This'll bring up the familiar XP view setting box. Just like in XP, click the 'View' tab then click 'Apply to Folders'. Or if you'd rather have a script do the work for you, here's a stupid-simple batch script that'll do it. I personally don't run with UAC running and use an Admin-class account but if you have UAC enabled or use a limited user (or both!) then you'll have to allow the batch to proceed. If you don't know how to make a batch file it's real simple. Copy that text into notepad, then save it. In the save dialog, change the 'Save as type' to 'All Files' then save it as CHANGE_FOLDERS_TO_GENERAL_TEMPLATE.bat or something. The name isn't important; the .bat at the end is. Then just double-click the file and baddabing baddaboom it's applied. To see the changes, you just have to log out then log back in (a full reboot is not required). You could restart the Explorer process but at least for me doing that nukes some of the programs in the notification area (like my CPU temp monitor). I prefer logging out then back in. Up to you, really. Now, you'll notice some caveats. This fix only works on 'normal' folders. It will not do anything for Libraries which are what you get by clicking the 'Documents', 'Pictures' and 'Music' buttons on the start menu. Those aren't folders so they can't be customized the same way and therefore this fix doesn't work on them. You can manually change those libraries however by right-clicking inside a library and clicking 'Properties', then changing the value under 'Optimize this library for' to 'General Items' (or whichever template you modified). You'll have to do that for each library manually but the setting you choose should stick. This fix also does not work on My Computer, My Network Places, Control Panel or other 'special' folders. Unfortunately there's no simple fix for that like there is with Libraries, but I can at least suggest doing things the XP way and using the 'Folder and Search Options' method to apply the view settings you want. I do not know if the OS will remember what you set but it's worth a shot. That's it! Pretty simple stuff and now you won't tear your hair out every time you're navigating a hard drive and suddenly a folder you open shows up in tile view instead of the view you've been using for the past month. Hope it helps! I was just recently wondering about this, thanks for posting up this guide! So, been running this setup for over a month now and am sad to report that as per usual, Windows sporadically forgets your view setting. Most of the time, yeah, it'll use this for all folders...but then randomly you'll go into a folder and it'll be Detail View and the 'Sort By' options will be all wrong. There's no rhyme or reason to it. That's why I stopped bothering with it. This is a good workaround IF you do not have a lot of files and folders. If you are like me that you have 5 hard drives (1 SSD included), with sh*tload of files and folders of all sort, it's just gonna forget someday anyway. I went and did a force reset on all folder settings, wiped a bunch of registry crap and started over. At least for now, it's holding the settings I asked it too. Woo! And as an added bonus... no more unnecessary crap in my Windows Explorer, and no more of that Library nonsense in my Start Menu! 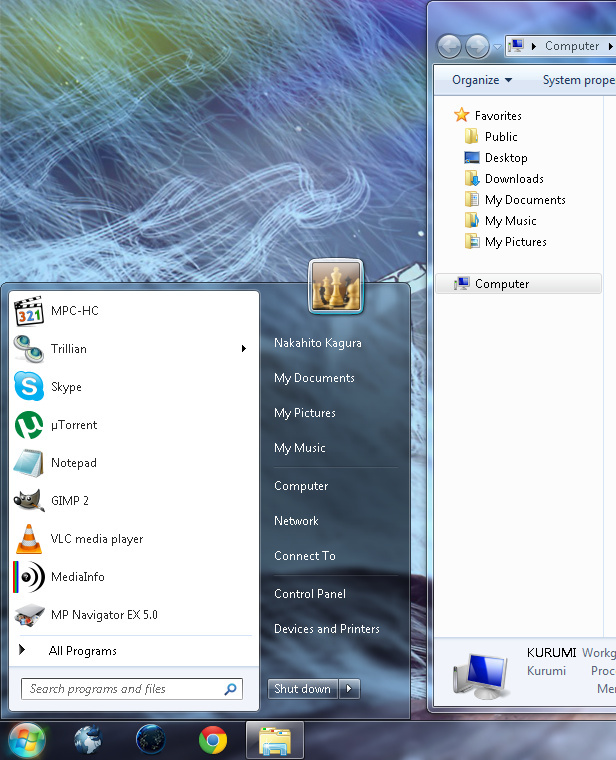 Two months later and Windows 7 is still displaying all of my folders correctly. Not a single instance of a folder showing up in anything other than list view. So it took about two years, but I'm finally experiencing minor glitches where Windows 7 will 'forget' what settings to use on a folder and assume something I don't want. Since it's so rare I just tell it to go back to what it should be and it works, but I guess I could just repeat this process over again and get another two years out of it. The fact that it forgets over a long period of time suggests that it's caching view settings for every folder somewhere, and when this cache goes over limit it defaults back to Windows 7's usual behavior. Which is silly--XP worked the other way around, meaning I never ran into this issue ever. Just figured I'd update in case people were curious.